As a professional hydraulic double drum vibratory roller manufacturer in China, we use internationally advanced technology and top quality main components in the production of our hydraulic double drum vibratory steel rollers. These hydraulic double drum vibratory rollers are ideal for compacting various stabilized soils, bituminous concrete and rolling cement concrete on road surface construction. This compaction equipment is widely used in the construction of high-class highways, airports, harbors, dams, municipal road and industrial ground. 1. These hydraulic double drum vibratory rollers are designed with Cummins water cooled diesel engine with rich power surplus. 2. Hydrostatic double drum travel drive is actualized by high quality hydraulic motors. There are two range infinitely variable speeds available. 3. The road rollers are equipped with dual frequency and amplitude vibration system with imported piston pump and motors. 4. Its center articulated steering system, together with the crab type travel mechanism, provides convenience for flexible maneuverability. 5. Our hydraulic double drum vibratory roller uses integrated multi-disc wet brake. It will brake immediately when the oil is cut off, thus ensuring the high safety. 6. It is designed with stylish and attractive appearance. Inside the surface layer, there is high quality inner bending side plate. 7. The upper surface of the drum is fully exposed, and the front and rear visibility may reach 1×1 meter standard, so operator can enjoy a wide vision. 8. The driver's platform can be turned for 180°. All controls are ergonomically designed for easy operation. 9. Two sets of imported water pumps, large capacity water tanks and sprinkler pipes improve operational reliability. 10. Streamline shaped appearance makes the hydraulic vibratory roller more attractive and front mounted operator's platform offers a clear vision to operator. 11. There are dual steering wheels and seats inside the spacious driving cab of the road rollers, which makes the operation more convenient and comfortable. 12. Our hydraulic double drum vibratory roller is fitted with electric power sprinkler system and large capacity reinforced polyethylene water tank. 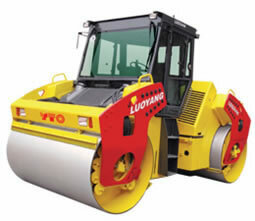 LTC214, LTC212 hydraulic vibratory road roller is designed with a double drum tandem vibratory roller. This compaction equipment is mainly used for the compacting operations in the construction of highways, municipal road, park area, and industrial ground. It is applicable to the compaction of bituminous concrete, sand gravel mixtures and cement concrete, etc. 1. This hydraulic double drum vibratory roller uses fully hydraulic double drum drive and vibration. 3. Hydrostatic center articulated steering system with crab type travel mechanism for flexible maneuverability. 4. The air conditioner and rotating seat in the driving cab make it more comfortable for operator to operate the machine. 5. The driving cab is turnover. This provides convenience for maintenance. 6. This paving equipment is designed with fork-type frame, which enables the steel roller to compact edge well. 7. The hydraulic pump and vibrating motors of this hydraulic double drum vibratory roller are purchased from American SAUER or German REXROTH. We specialize in producing road roller, crawler tractor, wheel loader, forklift truck, and many others. With more than 50 years of experience, we are quite aware of how to produce high quality products at low price. Now, our construction machinery and agricultural machinery are well received by our customers in more than 90 countries all over the world. Please do not hesitate to contact us if you are in need of any of our products.